Sarah Smyth had driving lessons in Blackrock and passed in Finglas. This was a last minute decision to go through with doing my test because i was that nervous i was going to fail, i decided to bite the bullet and give it a go and see what happened. After doing a 2 hour pre test 2 days before the test and a half an hour pre test the day of the test i was full of confidence, sailed through the test first time after the lessons i had with RSA. I cant stress how good these are and would highly recommend them to everyone,there straight to the point attitude and professionalism was second to none. Im delighted to say i hold a full licence and i honestly owe it all to RSA for there help. 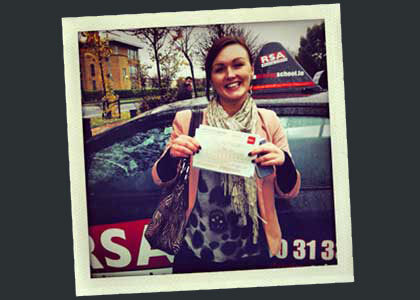 Lorna Curran had driving lessons in Rathgar and passed in Tallaght. Thanks to Michael and Colman for helping me pass my test. Michael was a my main instructor and was extremely helpful, honest and thorough in getting me to a place I could pass. 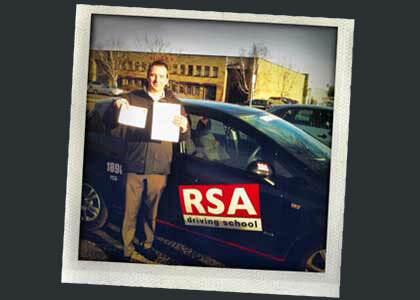 I'll be recommending RSA to my friends and family should they need a driving instructor. Thanks guys! If you're a beginner you will be required to complete the EDT program. The Road Safety Authority presented this collection of 12 mandatory driving lessons in April 2011. Addressing all aspects of driving from progression management to driving safely through traffic, the syllabus seeks to provide all the necessary knowledge to be a risk-free and competent road user . If you have to do your Essential Driver Training, we can help you get it done fast. Learning to drive in an automatic car is on the up. Being able to focus on aspects of your driving like progression management and night driving is undoubtedly one of the benefits of learning to drive in an automatic. For those that are troubled with changing gears or that just need an automatic licence we can help. We conduct automatic driving lessons all across Oxmantown. Call us now. Your time is now. You’ve finally got your driving test date after successfully completing your EDT . It's scary as hell but as Dublin's leading pretest driving school specialists we are the only realistic choice when it comes to test preparation. And our reputation speaks for itself...but don't take our word for it. Check out the kind words of our past pupils here. Many years ago female driving instructors were as rare as mermaids. As demand skyrockets, taking driving lessons with a female driving instructor is becoming standard which we think is fantastic for students and the driving school business . We have lady driving instructors all over Dublin ready to help you. Learning to drive is a lot easier in modern cars and all the modern features they come with. We are proud to offer our students the best possible driving lesson experience in our modern fully insured dual-controlled driving school vehicles. RSA Driving School has you covered. Moanie McMoanface had driving lessons in Dun Laoghaire and passed in Tallaght. 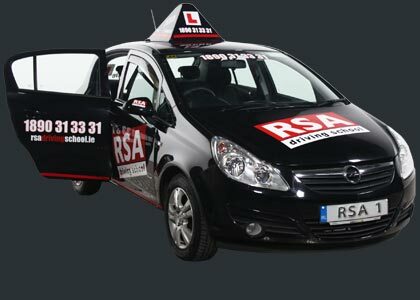 5 Lessons with RSA was all that I needed to pass my driving test, 2 of which i took on the morning of my driving test at Rathgar. 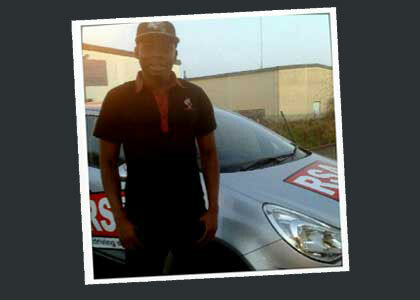 I passed my driving test in the first attempt, all thanks to Colman and RSA. Colman pointed out exactly what was required to pass my test. He took me through the test routes which surprisingly or knowingly turned out to be 80-90% similar on the driving test itself. He pointed out my technical faults that only the way he can and consistently drilled down on me till the faults were corrected. I still remember the proverb MSPO MSS while driving today. I would highly recommend RSA and especially Colman, he is arguably the best in the business. My only regret was that I should have taken my EDT Lessons with Colman. We won't patronise you with stories of our grand pass rates. The shameful truth is that any school that boasts pass rates of 98% are feeding you lies which they can not substantiate. Why try to mislead the public? Because their real reputation is poor and out of a desperation and want to get their hands on your hard earned euros, they try to manipulate you with fake stats. Here is the thing. Because of unforeseen circumstances or technical issues with vehicle a minimum of 10% of students fail the test on average. By this statistic alone you can see that only a 90% pass rate would be achievable on average and we can assure you this is seldom the case. Tread carefully when choosing your driving school and you see claims such as these. We let the pupils that have successfully passed their test with us do the talking and as you can see, when it comes to maximising your chances of passing the driving test, we are Dublin's number 1 pretest driving school. gare fitz had driving lessons in Dublin and passed in Tallaght. Passed my driving test with Peter! He's a wonderful instructor and knows what is needed to drive safely and confidently. I had a few lessons with him and he got me to where I needed to be! The cost is very reasonable! I used Peter's car which took the pressure off me in paying a fortune for insurance! 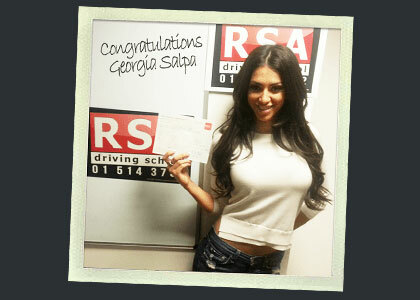 For anybody looking to passing there driving test first time, it's a no brainer! Couldn't recommend him enough! Cheers Peter for everything!